A light, domestic drama turns into a battle for national pride in this masterpiece from Lau Kar-leung – a wry, empathetic study into Chinese and Japanese fighting systems. Privileged kung fu student Ah To (Gordon Liu) is arranged to be married to the daughter of one of his father’s Japanese business associates. He initially feigns illness as a ruse to have the wedding postponed, but Koda (Yuko Mizuno) turns out to be a stunner, so he changes his mind. Koda is also a karate nut who quickly moves all of her Japanese weaponry into the house and starts smashing through the masonry with her Judo chops. The marriage is definitely on the skids when Ah To demands that she abandon her Japanese traditions and take up Chinese kung fu instead, but she revolts and actively refuses to integrate. The two have a series of domestics involving ninja stars being thrown across the dinner table before she packs her bags and heads back to Japan and into the waiting arms of her martial arts master, Sanzu (Yasuaki Kurata). Ah To, abetted by his mischievous valet Shao Kan (a quality comedic role from Cheng Kang-yeh), sends a childish missive to Koda outlining his problems with Japanese martial arts. An insulted Sanzu shows the letter to his sensai and the subsequent challenge escalates into an all-out fight fest. 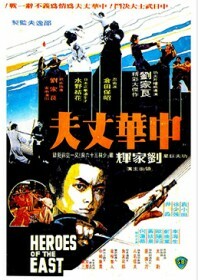 A troop of very serious Japanese fighters, each skilled in a singular discipline (Judo, sai swords, nunchakus, Kendo, Katana sword, karate and ninjitsu), step onto the next steamboat to China and individually challenge Ah To, who is respectfully given time to work on his countermeasures. This involves mastering Drunken Boxing from Beggar So (a great cameo from Lau Kar-leung) to defeat a karate fighter, and learning subterfuge skills to battle the illusionary tactics of Kurata’s ninjitsu. Lau is less concerned in exacting revenge or adding a wider political or historical motive to his culture-clash premise. Instead, the film focuses almost exclusively on stylistic contrast. Honourable characters stand firmly on nationalistic grounds but display a mutual respect uncommon in Chinese kung fu films of this period. This is best encapsulated by the film’s enduring final image which is one of reconciliation and hope. Remarkable, also, is the fact that not a single character dies throughout the whole film. Although Lau ultimately uses the central conceit to champion the variety and adaptability found in Chinese martial art styles, he is not above meriting the skill and virtue of the Japanese arts through his deft, intelligent choreography.